U.S. Pat. No. 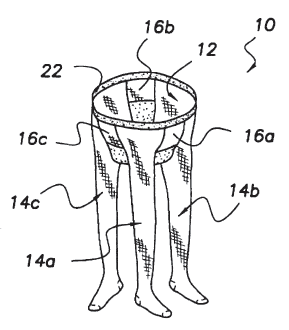 5,713,081: Pantyhose garment with spare leg portion. Millions of women risk embarrassment daily by having to wear pantyhose that have developed runs and other damage to the leg portions thereof to important business and social engagements. Although many women carry a spare pair of pantyhose in a briefcase, purse or car, the spare pantyhose often do not match the outfit being worn. It would be a benefit, therefore, to have a pair of pantyhose that included a spare leg portion that could be quickly and easily switched with the damaged leg portion. It would be a further benefit, if the spare leg portion could be discreetly stored under the wearer’s clothing when not needed. « Presenting on Intellectual Property Law at Ashland University on August 2, 2018.